There are 53 reviews of Déclaration d'Un Soir. I did not see it listed in the notes anywhere, but this hits with citrus. It's fresh. More of a dry rose. The spices cardamom and cumin mixed with the sandalwood actually give me a sort of cut flower stem accord. That smells good when it hits with the rose. Smells like a freshly cut bouquet at a flower shop. It is pretty strong, projecting pretty well for the first few hours. It just continues to smell fresh to me. And not overly feminine. Pleasant dry down that is more about the spices than the rose. Solid, though not remarkable. I bought this as a blind buy and I'm kind of "meh" on it. It smells great with the opening notes of citrus and rose but then as the drydown approaches, it begins to smell like a floral based, fabric softener. If anything, it would be wise to test a sample of this before buying it because it's a very subjective fragrance that you either like or hate. I like rose scents and have been looking for the definitive one for me. I've tried quite a few but have mostly been looking amongst Orientals. So this one's crept up on me really - I've had it for a while, but for whatever reason, it didn't really register with me as a contender. But as is the case with perfume collecting it seems, things change. So now I may be settling with Declaration d'un Soir as a surprise-hit rose scent. 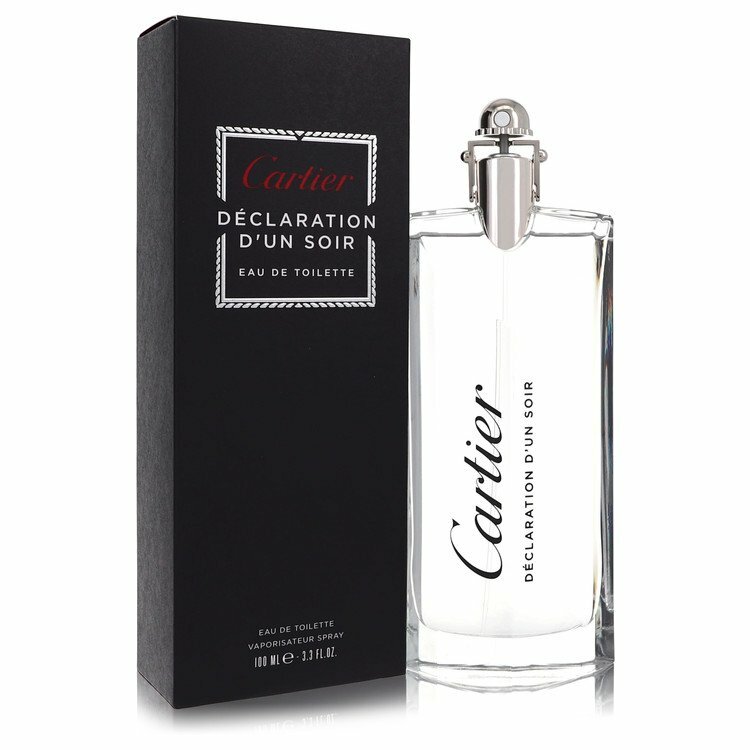 I love Declaration, and although this flanker centres around a delightfully piquant rose note (one I can almost taste) it retains the original's heart: peppery-spice, warm nutmeg, and skin-smell cumin/caraway notes. Later the creamy sandalwood/rose drydown is beautiful and lingers for a long while on my skin. So, all in all, a great scent. The Cartier DNA is one I enjoy, and the Declaration line is a particular favourite. D'un Soir has a great heart - ah, but the rose! Cartier is a house that always defies convention, and takes a lot of bizzare risks, yet consistently manages to stay relevant and "in the game" with their masculine releases, offering alternatives left-of-center compared to what else a guy could be wearing. 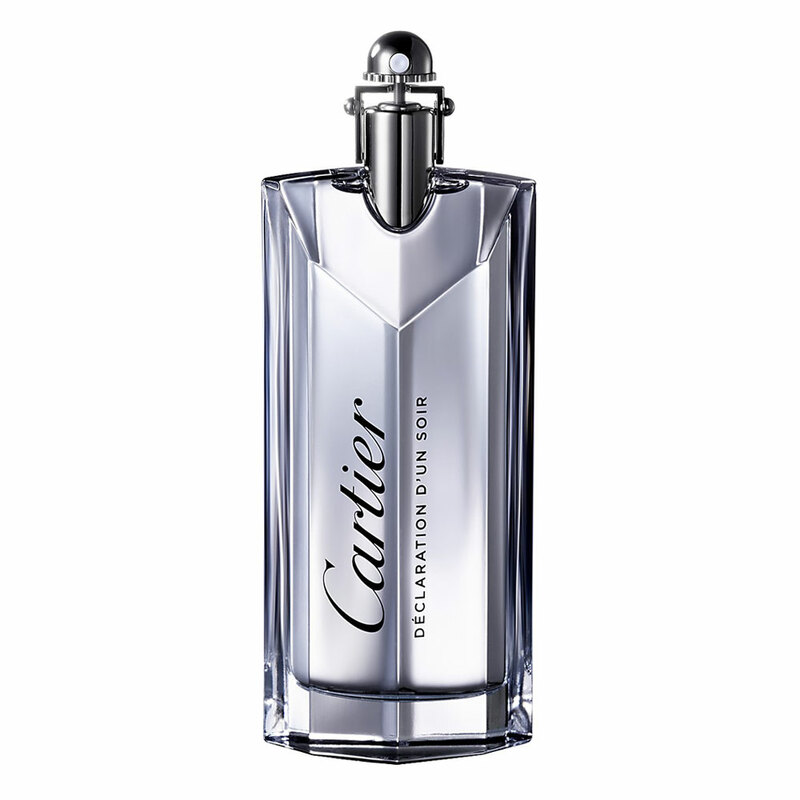 This started with Santos de Cartier (1981), then continued on with Pasha de Cartier (1993), and the fantastic Déclaration (1998), then Roadster (2008). Most of the more zany flankers which filled the gaps have been discontinued and carry silly prices just because of the "only the good die young" hype which often forms the pathos of most vintage collectors, but Déclaration d'Un Soir (2012) has stuck around, even spawning a flanker-of-a-flanker intense version recently. Why such success? 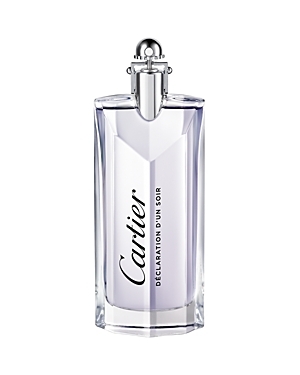 Well, it's hard to really pin it, but I'll venture a guess and say because Déclaration d'Un Soir smells much higher-end than it's top-shelf designer price thanks to a modern masculine dry rose edge that feels like a composition from a boutique Middle-Eastern royal house. Déclaration d'Un Soir is definitely no pour man's Amouage and there's no oud here, but appointed house perfumer Mathilde Laurent aimed to keep the original Déclaration pyramid intact, but build it out into what we find here, giving Déclaration d'Un Soir unusual complexity. Déclaration d'Un Soir opens similarly to Jean-Claude Ellena's original Déclaration with bergamot, bitter orange, and an ozonic tinge, but the dry rose quickly reveals itself very early on and remains a dominant note throughout, reminding me of a great many Mancera creations which also have this shrill ozonic citrus and modern processed rose. There's a nice set of shoulders under the head of Déclaration d'Un Soir however, and the cold spices of cardamom and ginger found in the original are bolstered with pepper, nutmeg and cumin, adding a slight piquant dirty growl to accompany the rose, but still very "Western" and not in the barnyard like a lot of Middle East rose perfumes. The stark leathery and woody base is also intact, but the cedar, leather, vetiver, and oakmoss are joined by an Australian sandalwood note, which isn't the preferred creamy rich Mysore kind found in vintage or prestige boutique creations, but it's still recognizable. Sillage is quieter than one might expect, and like the original Déclaration, this one has plenty of unisex and transgender potential, as little about leather and woody dry rose says much to me besides fanciness, and anyone can (and should) be fancy from time to time. Watch me spin~ ...Anyway, this also has longevity comparable to the original as well, which is moderate. Cartier bought at retail can reach Chanel and Dior levels of price, but deals abound for most of their line. Folks who found the juniper and artemisia of the original Déclaration too raspy or dry might enjoy the rose floral focus of Déclaration d'Un Soir, while fans of the original absolutely owe it to themselves to sniff this one, which almost beats it. You ultimately have to like rose to like this flanker, so while Déclaration is safer as a blind buy, this one is not, but does dip the toe more into a romantic aura thanks to that rose, while still retaining most of the safe-for-work versatility of the original. Comparisons are also drawn to the later Calvin Klein cK2 (2016), which seems to borrow the dry modern rose theme of Déclaration d'Un Soir, but surrounds it in science fiction synthetic notes like "wet cobblestone" and deliberately flaunts the unisex vibe; it's cheaper than the Cartier all around, but not better. Déclaration d'Un Soir is a great "almost-generalist" pale rose for all but the hottest and coldest of environs! Be sure to try the original Déclaration before this one if you've tasted neither, as so much of the appreciation for the line hinges on it. Huge thumbs way up! Not one of my favorite Declaration flankers. The bottle is impressive, but the potion within feels too tampered with. Muddled, dark moldy liquid that departs too much from the cumin woodiness that I'd come to love in the original. It's too chaotic and overinnovative, even with pepper and rose which are notes I love. I can't even pin down the proper occasions to wear this nor the Intense version; anecdotally, I tried some on as a test and got a not-so-pleased look from a fellow commuter afterwards. I am quite content with the flankers of Declaration that have already come out not to want to include this and its Intense version in my collection. But I am always open to whatever new concepts Cartier wishes to offer of the arguably legendary original Declaration. Really well blended selection of notes that create something erring on divine. I feel I'm really liking cardamom as a frag note! Cardamom and nutmeg (pleasing greenish fresh with a bite, piquant) over rose and sandalwood ( lush and smooth) created a opulent ( never brash ) and rich deep and pleasing aroma. Quite romantic, special occasion dress up fragrance. 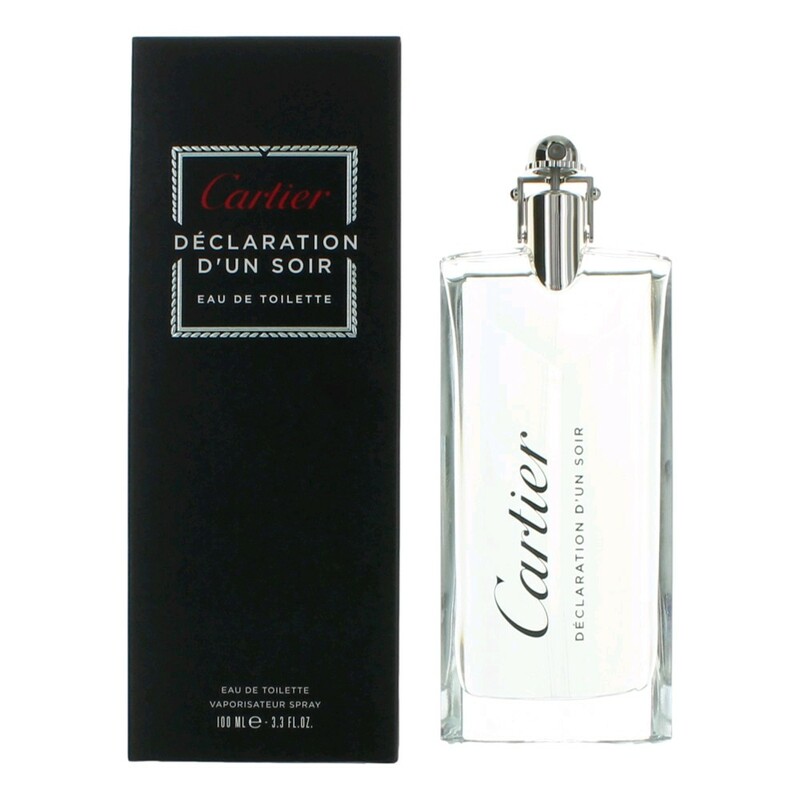 Cartier Declaration d'Un Soir Eau de Toilette 3.4 oz.